Our hotel in Gais in South Tyrol is a very special place. You instantly feel at home here, can relax, explore the surrounding countryside and simply just enjoy life. Our hotel in Gais in South Tyrol is a three-star aparthotel: there are rooms or holiday apartments available to you. Plan your holiday just the way you want! We at the Hotel Panorama in Gais in South Tyrol help you with this and do everything we can to accommodate your requests. Our hotel is situated in Gais in South Tyrol. You don’t know the place yet? Then we’d like to briefly introduce you to Gais, your holiday resort in South Tyrol, as well as our hotel. The municipality is situated in Valle di Tures ed Aurina/Tauferer Ahrntal, roughly five kilometres away from the town of Brunico/Bruneck. The Aurino/Ahr river that flows into the Rienza/Rienz runs through the valley. Our hotel in Gais in South Tyrol is situated at 840 metres above sea level and is surrounded by wonderful natural scenery. The hotel is situated on the edge of Gais village in South Tyrol in an extremely quiet location and is also an ideal starting point for day trips, walks, cycling tours and hikes. A little tip for all mountain enthusiasts: there are more than 80 three thousand metre peaks waiting to be climbed by you in Valle di Tures ed Aurina/Tauferer Ahrntal. By the way, did you know that the village was officially mentioned for the first time in the Bressanone/Brixen cathedral chapter’s “Traditionsbuch” from 985 to 993 under the name “Geizes”? 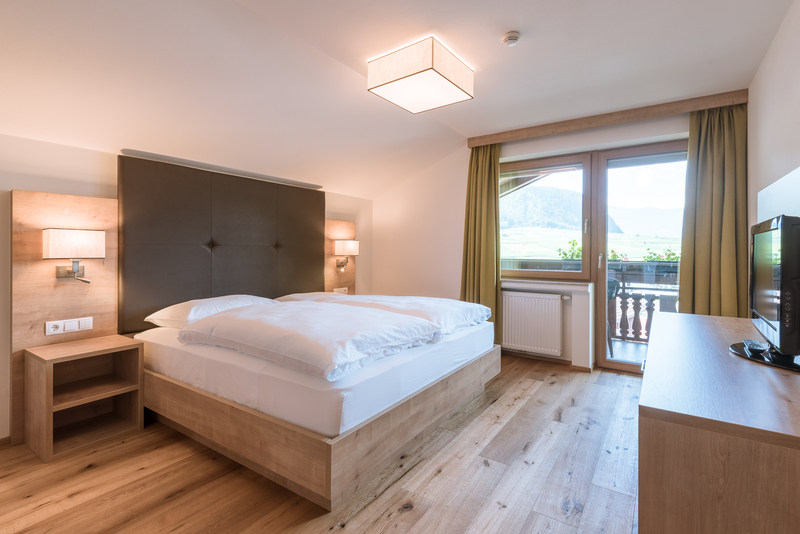 You can find every imaginable comfort you want for a holiday in Val Pusteria/Pustertal at our hotel in Gais in South Tyrol. We offer rooms and holiday apartments with breakfast in South Tyrol. Our generous breakfast buffet consists of fresh South Tyrolean quality products, such as bread, cheese, cold meats, yoghurt, cakes, pastries and much more. After a fortifying breakfast at our hotel in Gais in South Tyrol you start the day full of energy and enjoy it just the way you want. It so happens that you don't have to return to your hotel in Gais in South Tyrol at a specific time to not miss dinner. But if you like you are welcome to dine in the à-la-carte restaurant that is situated in our hotel in Gais in South Tyrol in the evening. Relaxation is also not neglected of course at our hotel in Gais in South Tyrol. There is a Finnish sauna, steam sauna and chill-out zone in our small wellness area that are all at your disposal. This is the right place to relax after an adventurous day in Val Pusteria/Pustertal. There is a great deal to experience around your hotel in Gais in South Tyrol. You can set off on various hikes in Val Pusteria/Pustertal in the summer. There is something for everyone: hiking fans can take high mountain tours, gentle alpine pasture hikes and even long walks in Val Pusteria/Pustertal. Or jump on your bike and cycle on the cycle path towards Brunico/Bruneck or into Valle Aurina/Ahrntal. Thrilling MTB trails are of course available to adrenaline junkies around our hotel in Gais in South Tyrol. Plan de Corones/Kronplatz, South Tyrol’s no. 1 skiing mountain, attracts skiers and snowboarders in the winter. The Speikboden and Klausberg ski areas, which are situated not far from our hotel in Gais in South Tyrol, are ideal for leisurely skiers and families with children. However, you can also enjoy several other winter activities such as tobogganing, ice skating, snowshoeing and cross-country skiing in the area around our hotel in Gais in South Tyrol. 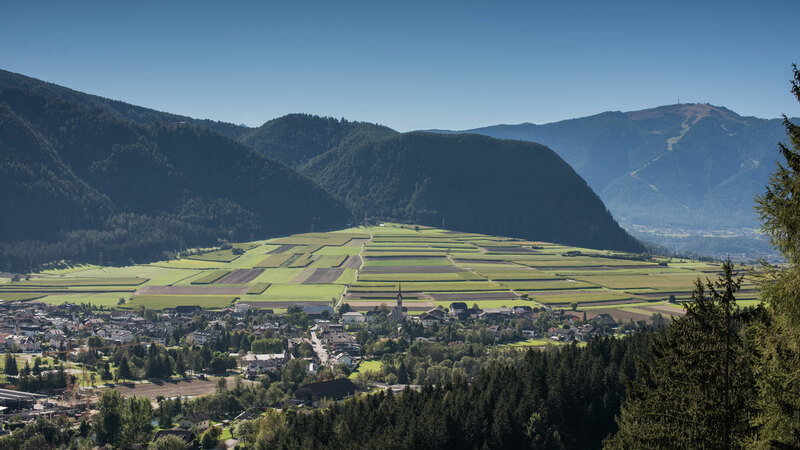 Culture lovers will find museums, churches and other sights in Brunico/Bruneck, roughly five kilometres away from our hotel in Gais in South Tyrol. Our tip: visit the Messner Mountain Museum Ripa at Castello di Brunico/Schloss Bruneck, the Messner Mountain Museum Corones on the Plan de Corones/Kronplatz peak and Castello die Tures/Burg Taufers, one of the best equipped castles in South Tyrol!